My first moments in Italy were spent exploring the incredible towns of the Northwest coast known as “Cinque Terre” (which translates to five lands. Pretty self-explanatory that one). We went in early October. This turned out to be a masterstroke, as we missed the crowds of the peak period yet still had some fantastic warm weather and were able to go for a swim. It was still reasonably busy, so I imagine going in the height of summer would probably be a nightmare. You want to avoid rain, as they may close the tracks during this time. Mid to late September, beginning of October is what I would recommend. There aren’t heaps of accommodation options in Cinque Terre. Many stay in the towns themselves, there are hotels but hostels are limited. We booked things fairly late throughout our trip and because of this our options were few and far between by the time we organised it. In the end we were lucky to get in at a hostel, “Ostello Tramonti”, in the tiny town of Biassa, about a 10 minute drive inland from the first Cinque Terre Town, Riomaggiore. And I couldn’t recommend it more. We made our way to Cinque Terre from Nice, via train, which meant we followed the incredible coastline all the way along. As we entered the area of the popular towns, I couldn’t help but marvel at how and why they even built the railway line through the cliffs and headlands to connect the tiny towns. I mean, here in Sydney’s North our Government hasn’t even managed to build a train line to our heavily populated area, and these guys were able to construct this infrastructure through seemingly impossible terrain? You’ve got to be kidding! If we’d have known, we would have got off the train in Riomaggiore (pronounced Riomaggableblore by the computerised voice on the train who seemed to get drunker the further we went) and caught the shuttle bus to our hostel in Biassa, but instead we rode through to the nearby city of La Spezia where we had to catch a taxi. Google Maps told me that the trip would be just over 10 minutes, so I expected a low fare. However, I was pretty annoyed to discover that we’d be charged a flat €20 to head up to Biassa. I vocalised my frustration to the driver, it went something along the lines of “Geez mate, it’s only 10 minutes up the road!”. Unfortunately, I think he misunderstood me and thought I was saying “We need to get there in 10 minutes!! !”, because he proceeded to the pedal to the metal and fly up the winding hill, screaming around tight blind hairpins to get us to Biassa as fast as he could. While I was used to this sort of driving behaviour after Vietnam, India and Sri Lanka, Kassy was not and she had crapped her pants. Biassa was literally a breath of fresh air. 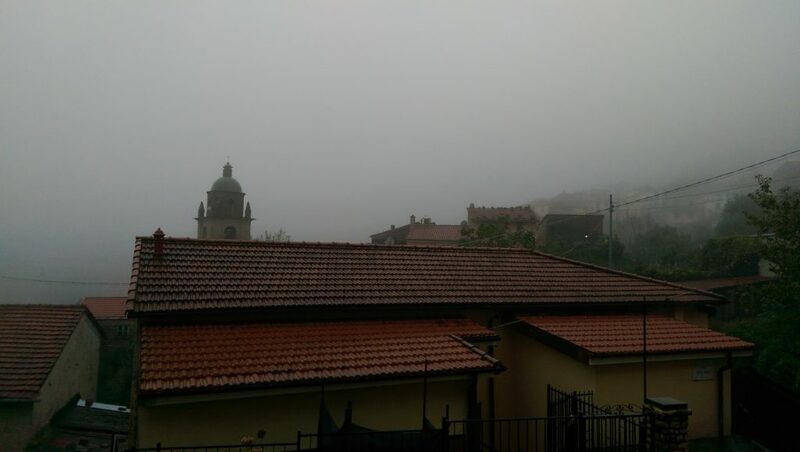 After being in cities for so long it was great to settle in to the tiny town in the misty hills. It had a pub, a little general store, a pizzeria and the hostel and that’s it. The hostel serves delicious pasta for dinner and a good breakfast for reasonable prices. They also run a free shuttle bus to and from Riomaggiore in the morning and evening, making it easy to access the Cinque Terre towns. The five Cinque Terre towns – Riomaggiore, Manarola, Corniglia, Vernazza and Monterosso – are connected by rail and also by trekking routes. Unfortunately, the first two of these paths are currently closed due to landslides that have occurred in the past few years. The standard thing to do is to catch the train (trains runs regularly along the line) to the last town, Monterosso, and begin your walk there. You’ll be told that you need a Cinque Terre pass to do you walks – we were told that we had to have one. However, I’m pretty sure you only need it for travel on the trains. As we had Eurail passes, we were already covered for that, so as it turned out we didn’t really need the extra pass. At no point on our walks were we required to show our tickets. 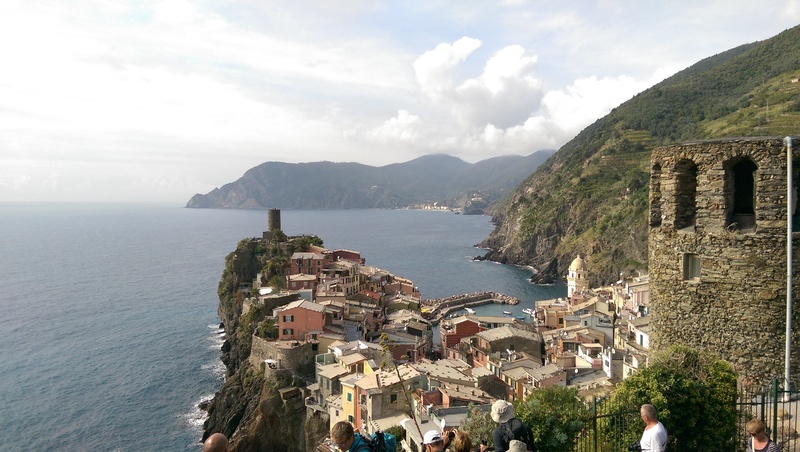 The two open walks – between Monterosso and Vernazza and Vernazza and Corniglia – take about an hour each. You go up and over headlands and hills, along the side of cliffs and through vineyards all the while being presented with some spectacular views of the colourful, fantasy-like towns and the beautiful natural environment including the Mediterranean Sea. Along the way you can stop for a delicious gelato, a bite to eat in the towns – seafood is the specialty around here – or a refreshing dip in the sea. 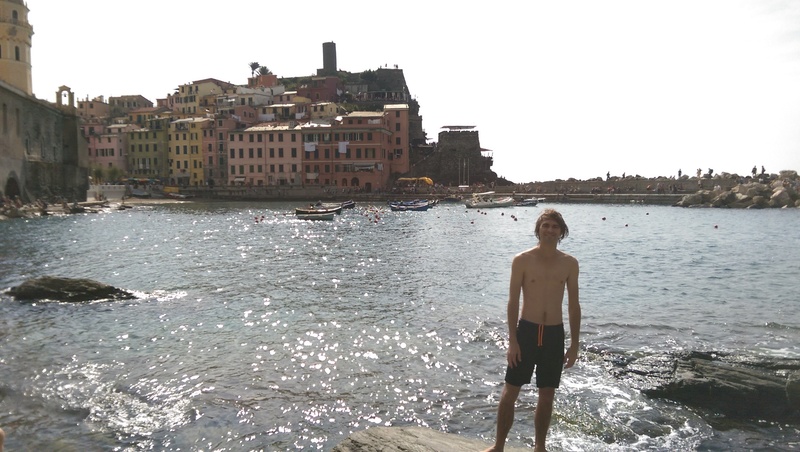 We went for a swim at Vernazza after the first leg of our walk. It was far hotter than we expected and the refreshment factor was 10/10. The water was sparkling and the scene, in front of the stacks of coloured buildings that overlooked us, was perfect. After the second leg to Corniglia, we used the train to visit the one remaining town, Manarola. Cinque Terre is one of those unique places that just has to be on any travellers to do list. It was one of the absolute highlights of my Europe trip and I wouldn’t have any hesitation in going back again. Click here for the official Cinque Terre website. Great post, you have summed up this beautiful part of the world perfectly. Really makes me want to go back to Italy. Thanks, glad you enjoyed it. Hope you get back there soon! Did you visit Monterosso? Tips on accomadations there? I did but only briefly – we started our walk along the coast from there. All 5 towns are very accessible by train so it does not really matter which town you stay at along the coast. Trip Advisor is a great place to start if you’re looking specifically in Monterosso. Cinque Terre is absolutely stunning.. I was fortunate enough to visit in 2012 and can’t wait to visit again soon! Your blog is so informative and helpful.